Small G-protein antibodies for fixed cell localization and western blot of RhoA, Rho, Rac1, Rac and Cdc42 protein GTPase. Cytoskeleton provides a range of antibodies raised to the Rho family of small G-proteins. They have exceptional isoform specificity and each are provided with human platelet extract as a positive control. For more information on each antibody please click on the products below. Q: How do I know whether the Cdc42 monoclonal antibody is good for Western blotting and IF? A: The datasheet (Cat. # ACD03) and the website's individual product page (ACD03) descibe the applications for all Cytoskeleton's antibodies. The Cdc42 antibody (Cat. # ACD03) was raised against a peptide sequence of human Cdc42 (amino acids 123-141). The Cdc42 antibody will not cross-react with a ten-fold excess of RhoA, RhoB, RhoC, Rac1, Rac2 or Rac3 proteins. Non-specific bands have been observed at higher molecular weight in about 50% of cell lines tested. The antibody has been tested by western blotting and immunocytochemistry. 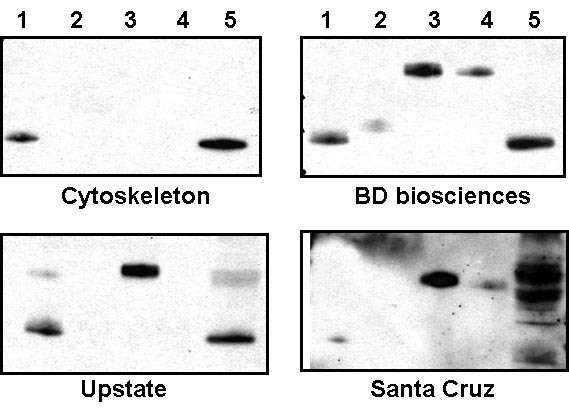 Please see the Citations tab for references that have used this antibody. Q: Can I test a sample of the RhoA monoclonal antibody? A: All of Cytoskeleton’s antibodies are rigorously quality-controlled and tested under the conditions described in the product datasheet. In the rare event of a problem with an antibody, please contact our technical service group (tservice@cytoskeleton.com) for assistance. Free samples of the RhoA antibody (cat# ARH03) are not available. However, please contact Cytoskeleton’s customer service department (303-322-2254 or cserve@cytoskeleton.com) to check on any special discount offers.